Whichever way you look at this new CE - as an up-spec'd S2 or down-spec'd Core model - it's a cracking guitar that distils the essence of PRS, the detailed build, intonation, resonance and style, into simply a very pro- spec instrument. Price, build, sound, vibrato, intonation. A cracking workhorse. Limited colours and no options, so you're stuck with one neck profile... and those birds! Let's look at the facts. At full retail, the start price of PRS's 'full-fat' USA-made Core-line Custom 24 is £2,939. 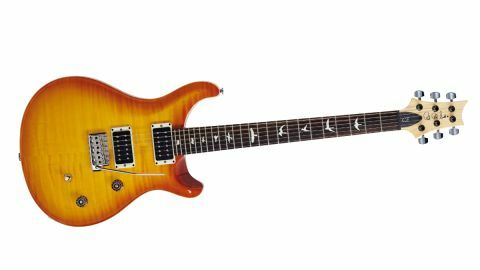 PRS's more economically made S2 version, constructed in PRS's USA factory, is a lowly £1,375. That's quite a gap, and for many of us the former is out of reach and the latter is, ahem, not quite PRS enough. Enter the all-new 2016 CE 24, which drops in comfortably under the £2k mark. PRS is purposely not calling it an S2 guitar, although some of its features (neck construction-style and hardware) are the same. But unlike the S2 Custom, for example, the CE is loaded with the USA- made, uncovered 85/15 pickups that grace the current Core Custom 24 and the body is a very close cousin to that Core model, too. Whatever the backstory, pulling the new CE from its gigbag, not hard case, is a little like meeting up with an old friend. On its introduction in 1988, along with it being the cheapest PRS guitar, it was the first to feature a bolt-on maple neck and seemed to signify a more rock 'n' roll workhorse, gigging PRS. So, what's changed? First, it's the first PRS bolt-on to use a slab-sawn three-piece, as opposed to quarter-sawn one-piece maple neck:a more economical use of more easily available wood with a separate piece for the headstock and heel-piece. As always, the neck here has a nitrocellulose finish; it's slightly toned in colour and has a satin finish that'll quickly burnish up to a glossier sheen with playing. Importantly, it's much faster to apply than a standard gloss finish. Second, while the body looks like a standard Core Custom, on closer inspection you see some subtle - and cost-saving - differences compared to the Core body. There are no carved indents under the controls and toggle switch, and there's less rise to the top carve. "Add amp grit and it's power-Fender tone, with a bit more balls, and perfect for modern country." Also, in overall depth, the CE measures 44mm, pretty much the same as the S2. The mahogany back is around 31mm thick, leaving the maple top at around 13mm thick - a mahogany-to-maple ratio of pretty much 70:30. By comparison, the Core Custom is around 49mm thick with a 28.5mm-to-20.5mm mahogany-to- maple ratio of 60:40. However, the actual rim depths of both are pretty similar: cleverly, to the eye, things appear more similar than they actually are. PRS's glued-in or bolt-on necks are virtually identical in the way they fit into the body. The neck's heel extends underthe neck pickup where it's glued or, as in this case, screwed tight via four machine screws through a metal neck plate. There are no options and that includes neck shape: here it's PRS's Pattern Wide profile - in old money, a Wide Thin - which is new to this S2-style neck. That translates to the same width at the nut and top fret as a Pattern (Wide Fat) of 42.9mm and 57mm, but a slimmer depth: 20.9mm deep at the 1st fret and 23mm at the 12th. Standard size fretwire is used, as opposed to the bigger wire we're seeing more of in the Core line, and the fingerboard edges are subtly rolled to feel like a well-played guitar; fretting and setup are as crisp as ever. On the un-faced headstock, eagle-eyed PRS fans will notice that the raised Paul Reed Smith logo is smaller than those placed on the head face of the current S2s, and is chrome, not gold-coloured. The CE logo on the black truss-rod cover seems slightly off-centre on our prototype, but that's been fixed on the production models. If there's a whiff of economy about the guitar in its USA-designed, Korean-made parts and that top carve, then the USA 85/15s provide a balance. These uncovered versions of the covered 85/15s have distinctly square-edged bobbins, a proprietary design like the low-profile cream pickup rings and the multi-flanged 'lampshade' control knobs. Unlike the Custom's current five-way lever pickup selector, here, we have what's known as the 'McCarty electronics': a Gibson-like three-way toggle pickup selector switch, master volume and tone, the latter with a pull/push switch to simultaneously coil split both pickups and voice, primarily, the screw coils of each. Typically, it's PRS's modern 'partial tap' circuit that doesn't entirely switch off one coil, leaving some of the 'dumped' coil in play. We also have a small treble-bleed cap on the volume control to retain some highs as the volume is reduced. Incidentally, both plastic rear coverplates, for the control and vibrato spring cavities, sit on top of the wood, S2-style, unlike those on the Core models, which are recessed flush. The 'old friend' appearance we mentioned translates to the feel, too, certainly in comparison with the chunkier McCarty thickness models (pretty much all of the current Core double-cuts with the exception of the Custom) or guitars such as the S2 Standard Singlecut Satin we looked at in our last issue. There's some of that skeletal 'super-model' feel, along with a light weight (as here), that made early PRS guitars feel so different. The neck shape, again compared with the pattern, does feel skinnier, but not in a bad way. Although the 24-fret neck seems to stick out more from the body than, say, a Stratocaster, strapped on, it takes only moments to adjust. If the drive is familiar, the modern sound of the PRS is getting that way, too. There is a very vintage-y output here that's clean and clear, which results in almost bell-like chime that seems to lack the midrange hump of older PRS pickups. Now, the guitar's voice (its acoustic resonance) is going to be different here compared with the 30th Anniversary Custom, and there's something that the maple neck puts into the stew, a subtle upper-mid attack and percussion, that this writer has always found extremely valid lending a small amount of 'Fender' to the taste combined with plenty of thunk and a soupçon of clarity from the body. "There's some of the skeletal 'super-model' feel that made early PRS guitars feel so different." Along with the excellent in-tune vibrato and the whole way PRS has squeezed every ounce of resonance from its instruments, the ring and clarity for cleans or crunch tones is quite exceptional. Okay, we don't have that huge low-end of a Core Singlecut, but again, that seems to suit the halfway- between-Gibson-and-Fender vibe. There's plenty of classic-rock power from the 'buckers, but no lack of balance, while the lower output single-coil voices lend another flavour. It's not a dead-ringer for a Strat or Tele, but simply another texture that really suits older styles along with country or Americana; add a little amp grit and it's power-Fender tone, with a bit more balls, and perfect for modern country styles. There's a very balanced output string-to-string, which is not always the case with traditional single coils with their numerous variants of pole piece heights. Seriously, these split voices aren't to be sneezed at. In trying to listen to as many different sounds as possible during our test time, we were in split mode at least half of the time.